in medium size bowl. Butter a 9x13 inch baking pan. cream butter and granulated sugar until light and fluffy, about 4 minutes. Add eggs, one at a time, until well combined. Add vanilla, and beat until combined. Add reserved flour mixture and the sour cream, and beat just until well combined. Fold in 2 cups blueberries. Spoon batter into prepared pan. 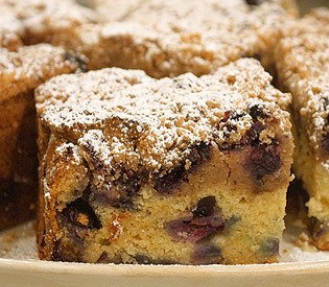 Toss remaining cup blueberries with the crumb topping. Sprinkle crumb topping over cake. Bake until golden brown and cake tester comes out clean, 50 to 60 minutes.